Louise Sauvage is one of the most celebrated athletes in Australian sporting history. 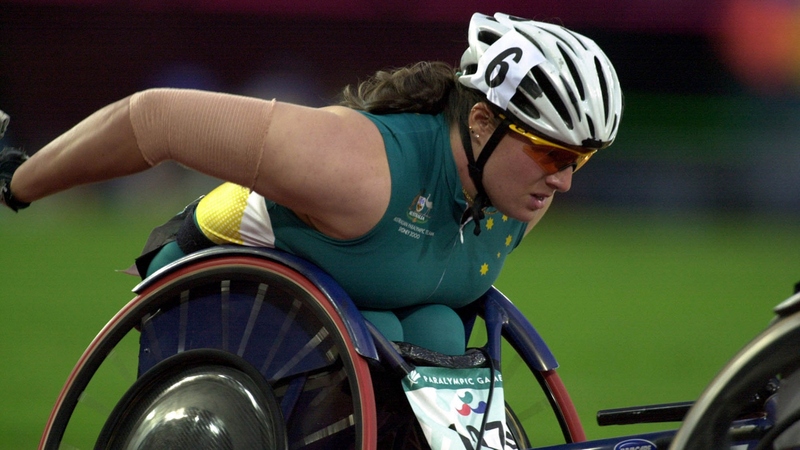 A four time Paralympian, Louise dominated the sport of wheelchair racing over a decade claiming titles in distances from the marathon to 100m events. She is without doubt one of Australia’s most successful athletes, a truly international sporting identity and is an outstanding motivational speaker. 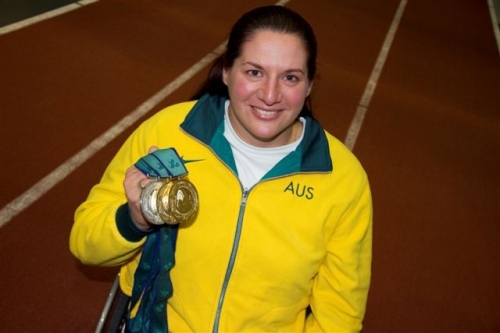 Originally from Western Australia, Louise began her international dominance in 1990 when at age 16 she claimed gold in a world record time in the 100 metres at the IPC World Championships in Assen – her international debut. However it is Louise’s record at Paralympic Games that speaks for itself. At the 1992 Paralympics in Barcelona she claimed a hat-trick of gold medals, taking victory in the 100m, 200m and 400m events as well as picking up silver in the 800m. This silver in the 800m was to be the last time Louise was beaten in this distance at international competition until the Sydney 2000 Paralympic Games. In 1996 in Atlanta, Louise cemented her dominance on the world stage. Her brute strength and fierce determination guiding her to gold in the 800m demonstration race at the Atlanta Olympic Games – the only time the Australian flag was raised and the national anthem played in the main stadium during the Olympic Games. She then went onto to record victories in all her track events at the Paralympic Games – gold in the 400m, 800m 1500m and 5000m distances. At the 2000 Paralympic Games in Sydney, Louise’s status as a national and international icon was recognised when she was chosen to light the cauldron at the Paralympic Games Opening Ceremony. She again competed in the 800m demonstration race at the Sydney 2000 Olympic Games defending her title from 1996 and taking home gold for Australia. At the Paralympic Games she added to her career Paralympic medal tally with silver in the 800m and gold in the 1500m and 5000m. Australian Paralympian of the Year in 1994, 1996, 1997 and 1998, Louise also dominated the sport of wheelchair road racing claiming victories in some of the world’s most prestigious road races including four 1st place titles in the Boston marathon and multiple 1st place honours in the Los Angeles, Berlin and Honolulu Marathons. 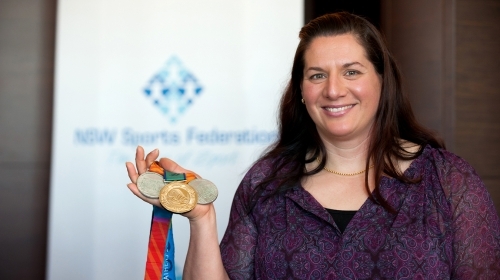 Louise was recognised as the 1999 Australian Female Athlete of the Year, has been inducted in to the Sport Australia Hall of Fame, has legend status in the NSW Hall of Champions and was honoured with an Order of Australia Medal to name just a few of her career. At her Paralympic farewell in Athens in 2004, Louise won silver in the 400m and 800m events bringing down the curtain on an illustrious career. Louise Sauvage Pathway (Sydney Olympic/Paralympic Village). Sauvage Street – (2006 Melbourne Commonwealth Games Village). Inducted into the Sport Australia Hall of Fame – 2007. Inducted into the NSW Hall of Champions – 2005 and elevated to Legend – 2009. Inducted into the Western Australia Hall of Champions – 2011. Australian Institute of Sport ‘Australian Dream Team’ (selected as one of the 21 elite athletes in the history of the AIS to celebrate the AIS’s 21st birthday). This Is Your Life Program. Numerous School Houses – Nationally numerous schools have named sports houses after Louise. Channel 9 – 20 to 1 Program – 20 Most Outstanding Australian Sports People in the past 30 Years (2008) – # 13.